Oops, did I say "sewing table"? I meant "drawing table"--or more precisely, computer desk, since I draw directly into my Mac. I'm back from a fabulous trip to San Francisco but there will be no sewing until I finish a few exciting sewing-related illustration projects. While on vacation, I deliberately ignored my Google Reader, so I am only just now catching up on all YOUR sewing awesomeness (Me Made May isn't happening for me, but I'm loving it vicariously). But I did follow the continuing comments on my frustrated post about natural-waisted jeans, "In Defense of Mom Jeans", and I totally recommend taking a read--a lot of you feel really strongly about high vs. low waists, and the discussion is still going! I don't know if I'll go for a boot-cut, though--think I'll do them straight, or even skinny. We shall see! I also finally bought the Colette Ginger skirt... I was buying the Jalies from Pattern Review anyway, and I have just the denim for it. I'm somewhat embarrassed to realize that I own quite an expensive and large collection of Colette Patterns, including the handbook and Macaron, Ceylon, Crepe, Sencha, Parfait and now Ginger... but NONE of them have ever made it past the muslin stage (though admittedly, I muslined/altered several of them while pregnant, then realized they would look better with like, a waist.) Let's see if I can change that up. I don't have pictures yet, but the sock is now almost-done (though it of course needs a twin sister, argh!) 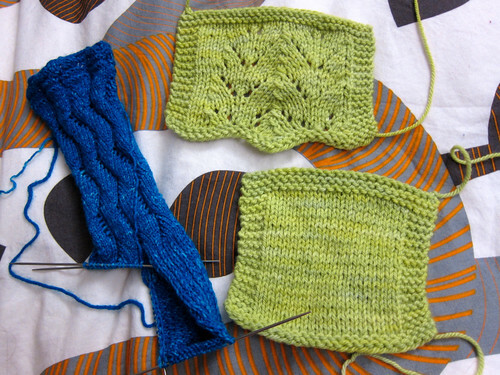 and I've cast on and gotten a good ways (er, a few inches) on the lacy center of the cardigan. So: what's your most expensive pattern you've never actually sewn? Oh, exciting. I totally can't wait to see those illos. :D *AND* what you do with the jeans. Notes on the kids sizes---you may want to make the size up. Not because they run small (they fit true) but because the darn kids grow. The first pair I made was for Tyo and while they fit like a dream, she promptly had a growth-spurt and couldn't wear them after two months. /sigh. And don't cut the waistband on the diagonal, but I'm sure you know that. :) Good luck with getting your schedule back to normal! Your knitting pieces are sooooooo pretty that I think I just drooled on my desk :) I love seeing what's on your drawing table! I am a big fan of all of your illustrated/designed goodies - they warm my heart. I'm looking forward to see your version the Jalie Jeans. About the most expensive patttern I sew, i'll say it's the vintage advance pattern blouse I'm currently working on, it cost me around $40... So I'm taking my time learning how to make bound bouttonholes et sewing it very well.. I bought the ginger last week to make me a jean skirt, just like you !! Great minds...I intend to make the version 3 in biais. Wich one do intend to sew ?